Celebrated each year on August 15, the Feast of the Assumption of the Blessed Virgin Mary commemorates the death of Mary and her bodily assumption into Heaven. Because it signifies the Blessed Virgin's passing into eternal life, it is the most important of all Marian feasts and a Holy Day of Obligation. 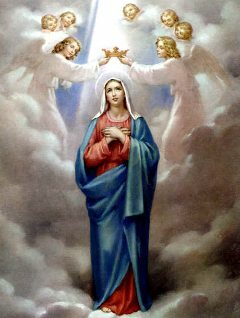 The Feast of the Assumption of the Blessed Virgin Mary is also known The Solemnity of the Assumption of the Blessed Virgin Mary, The Assumption of Mary Into Heaven, The Dormition of the Theotokos and The Falling Asleep of the Blessed Virgin Mary. The Feast of the Assumption is a very old feast of the Church, celebrated universally by the sixth century. The feast was originally celebrated in the East, where it is known as the Feast of the Dormition, a word which means "the falling asleep." The earliest printed reference to the belief that Mary's body was assumed into Heaven dates from the fourth century, in a document entitled "The Falling Asleep of the Holy Mother of God." The document is written in the voice of the Apostle John, to whom Christ on the Cross had entrusted the care of His mother, and recounts the death, laying in the tomb, and assumption of the Blessed Virgin.